This topic contains 8 replies, has 4 voices, and was last updated by miff71 4 years, 1 month ago. Hello Billy, only just discovered your wonderful site purely by accident. My name is John Lewnes and I was born in North Street in 1941 in the shadow of Wolverhampton Wanderers.As both of my parents were working I spent most of my formative years at my Paternal Grandparents in Oxley.I well remember going with my Grandmother each week to the tripe shop just off Queen Square, afterwards passing the Hippodrome (and having a sly look at the photos outside of the partially clad nudes)on to the Pork shop in Princess street, opposite was Viking Cycles where I had purchased my first two wheeler.On next to Melias the grocers where my Mother worked,afterwards we would visit Tweedies for my Boy Scout uniform,then across the road to Lings music shop for my sheet music. Then down a shopping arcade that ran down to Lichfield street passing a wonderfull toy shop, called, I think, Sherwood Miller. My cup runneth over, new blood, new memories. Welcome, thrice welcome. It’s going to be a toss up who’s the more excited, me or Bill. Fill us in, school, works, where are you living now, dens of iniquity visited, you must have had some, I notice we shared a fondness for sly looks at the Hippodrome showcards. I too had my first bike from Viking Cycles in Princes Street, Bill, didn’t Viking have some small factory premises opposite St Peters School, Cups of tea at the UCP Tripe Shop, Tweedies, but I only got as far as the Cubs, and yes Sherwood Miller in the Arcade. You were able to buy individualbits of Meccano there. As George says wonderful to have new blood on site. I see you were born in North Street its a terrible shame you wouldn’t recognise your birthplace today even its name has been changed. All the places you mention I have written about in my stories on many occasions, and just picking out the Viking, besides being located in Princess Alley and later Russell Street, they did have as, George said; a busy workshop in St Peters Square at one time. 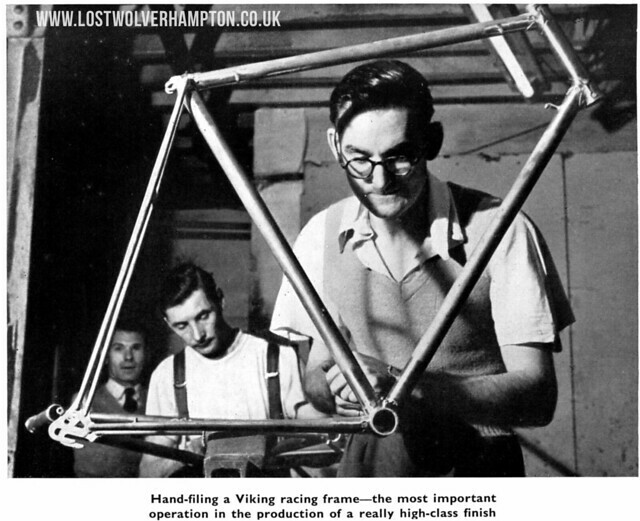 Here we see a couple of Viking staff hard at it and perhaps they maybe working on that bike specially made for you, or George, in those glorious days of the 1950’s. Thank you George for your welcome note, and thank you too Billy for the photo. I seem to recall my cycle was signed by Ian Steele who I think was a competition rider for Viking.So far as the fleshpots of the town were concerned,initially we frequented the “Milano” coffee bar, situated in a cellar down Darlington street,later, when we had become motor cycle owners it was the Queens ballroom, and later on, rocking and rolling to the sound Of the Tommy Burton Combo down at the Scala.I started school at, I think, Red Cross school, afterwards, my Father opened a garage in Wednesfield. After school, I gained an apprenticeship with Charles Clarke garage in their service dept. in St. Marks Road Chapel Ash, later moving to Attwoods garage just down the road. We now live in rural Worcestershire but it`s good remember the town as it was. Thank you John,Keep in touch on here or on our facebook group. Well,this is the “hat trick”,my first bike was from Viking cycles as well! After my granddad died in 54, nan said Ill buy you both a bike as a last present from granddad. Mine was same colours as the Wolves, gold frame and black mudguards,sisters was blue. Just the job for an avid train spotter like me (and every other kid in Fordhouses) Many a time it saw 3 up as we went off on a mission somewhere. Later on the Tropicano/Rollerdrome/Star Aluminium club/Queens/Pubs/Girls/Motorbikes/cars,all the things of growing up in the 50s/60s. Is it me or wot!Thats Twice my “tome” has turned red in places. Not the best when it comes to computers,mind you I can screwcut a 4 start Acme thread, so that balances out a bit.Miff. 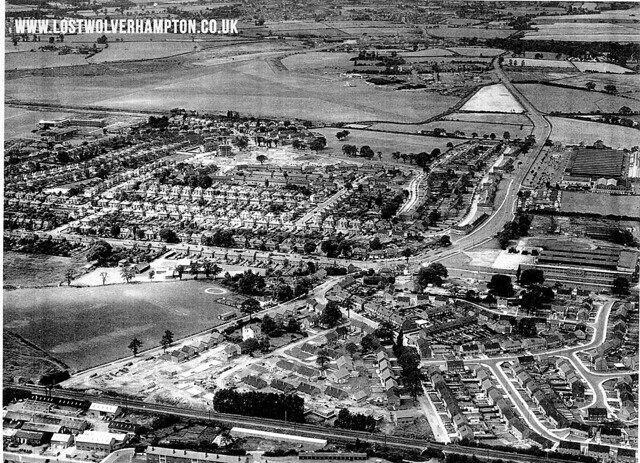 Here you are Malcolm, an aerial veiw of Fordhouses – Probably showing your old house, and perhaps the railway at the bottom there close to Fordhouse Road were you train spotted. Peaches Lions and Heroes If you still have it check out a picture of a lady in the lions cage . I can tell you the full story. Nice one Billy. I can see our house in Southbourne rd! Wobaston school is there as well.In `57 we bought a house in Taunton Ave. which backed on to the railway lines.At first the noise was horrendous,but after a few weeks we never heard a thing,and they used to roar past!Worst time was at night, if you couldn’t sleep you could hear the coal trains coming from as far away as Featherstone, 10 mph chug chug chug getting louder & louder till it passed,then it was clank clank clank as the wagons passed.That passed away an hour or so. Whats the story of the lady in the lions cage then? I`ve still got Peaches Lions & Heroes,bit dog eared now though.